“Companies like Harris Communications and all those who donate equipment enrich the N-CHATT program so our technology trainers can reach people and provide actual and practical listening experiences,” said HLAA Executive Director Barbara Kelley. 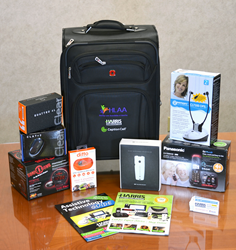 The Hearing Loss Association of America (HLAA) Network of Consumer Hearing Assistive Technology Trainers (N-CHATT) received a generous donation from Harris Communications and several leading assistive technology manufacturers. Each N-CHATT trainer will receive a kit that includes a ClearSounds CLA7v2 Amplified Power Neckloop accessory for cellphones, ClearSounds Quattro 4.0 LITE adaptive Bluetooth neckloop system, Geemarc CL7350 amplified TV headset, Sonic Bomb alarm clock, Williams Sound Pocketalker 2.0 personal amplifier, Panasonic Link2Cell KX-TGM430B amplified Bluetooth phone, and a Ditto Bluetooth® Vibrating Cellphone Signaler and Alarm - all packed in a quality carry-on roller bag provided by CaptionCall. HLAA’s-CHATT is a volunteer consumer train-the-trainer program. The program’s goal is to build a network of consumer trainers with the knowledge and skills necessary to train others impacted by hearing loss. Trainers will assist others in the successful integration of hearing assistive technology to support individual hearing and communication needs at home, work, school, and the community. The HLAA N-CHATT program is a partnership with Gallaudet University and the American Institutes for Research. It is being implemented under the Gallaudet-led Deaf/Hard of Hearing Technology Rehabilitation Engineering Research Center (RERC), which is supported by a grant (# 90RE5020) from the U.S. Department of Health and Human Services, National Institute on Disability, Independent Living and Rehabilitation Research (NIDILRR). “There are many people with hearing loss who want to use technology to stay in the hearing world, yet they often don’t know what is available beyond hearing aids or cochlear implants. Companies like Harris Communications and all those who donate equipment enrich the N-CHATT program so our technology trainers can reach people and provide actual and practical listening experiences,” said HLAA Executive Director Barbara Kelley. For more information about N-CHATT, e-mail N-CHATT@hearingloss.org or visit http://www.hearingloss.org/content/n-chatt-training. For more information about Harris Communications, visit http://www.harriscomm.com, or call 952-388-2152 (video phone) or 1-877-539-7445 (voice) to speak with a hearing loss expert. Harris Communications offers HLAA members a 20% discount (some exclusions apply). Based in Eden Prairie, Minnesota, Harris Communications, Inc. is a leading supplier of assistive products for the Deaf and hard of hearing. Since its founding in 1982 by Dr. Robert Harris, himself a member of the Deaf community, Harris Communications has helped millions of deaf and hard of hearing customers enjoy their lives to the fullest by providing expert advice and a wide range of more than 2,000 assistive devices and educational resources. The company’s product line includes alerting devices, phone and TV amplifiers, personal amplification systems, tinnitus maskers, books and media and much more. Harris Communications also supplies ADA compliance products and hearing protection equipment. The Hearing Loss Association of America (HLAA), founded in 1979, opens the world of communication to people with hearing loss through information, education, support and advocacy. HLAA holds annual conventions (HLAA2018 is in Minneapolis, Minnesota, June 21 – 24), produces Walk4Hearing events in cities across the country, publishes the bimonthly magazine Hearing Life, advocates for the rights of people with hearing loss, and has an extensive network of chapters and state organizations. The national headquarters is located at 7910 Woodmont Avenue, Suite 1200, Bethesda, MD 20814. Phone 301.657.2248 or visit hearingloss.org.